Nihao to all of you out there who are just plain crazy about Shampoo! You're more than welcome here because Shampoo is just the greatest anime character I ever knew! I created this site to give information and all-new picture-previews about the Chinese girl. I know that lots of stuff about Shampoo is untrue on the web... I understand that, she is a difficult-to-understand character. That's why I wanted to point out what's true and what's not true. So that everybody can enjoy her and know her better. Now I know most of you came here to find pictures of the kawaii Chinese girl. And on every site you always find the same pictures am I right? Not that they aren't great! But do you know what happens when a guy who is crazy about Shampoo got the power to draw her? Put a pencil in his hand and that's it! He goes studying in animation and continues drawing pictures of Shampoo every night and day... And then, he creates a website about her... That's right! Every picture you'll find here, I drew it myself! I own every Ranma anime "Shampoo-including" episode , Chroma-Cel, CDs, Lyrics; anything with Shampoo in it! You name it! Since I draw my pictures mself, I think I got the biggest collection of Shampoo pictures on the face of this planet... Now, enough of this! Time for Shampoo to shine!!! Enjoy the site! 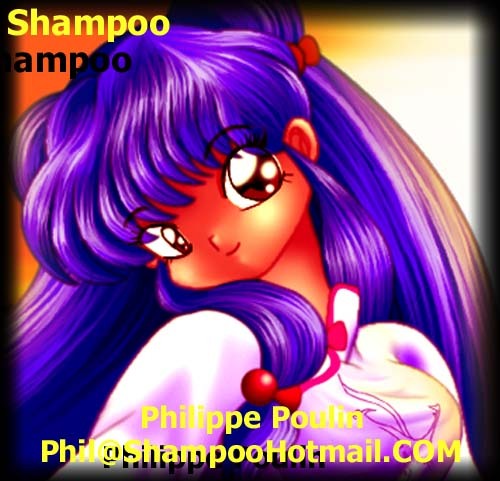 - Changed: Song page picture to "Shampoo Sing Beautiful Song!" - Changed: Title page picture to "Cute_Kitty"
- Changed: Info Level 1 page picture to "Shampoo Visit Tower"